Coconut (Cocos nucifera) is very beneficial. Indonesia with the longest coastline in the world and covered with coconut trees. Based on data from wikipedia, in 2010, Indonesia is the second largest coconut producer after the Philippines. Young coconut water is a clear fluid inside the coconut. Please dont be confused with coconut milk, coconut milk is the white and oily liquid that comes from the grated meat of an old coconut. Please read coconut milk on wikipedia. I usually drink young coconut water, with only small amount of meat, and the maximum is only one fruit per day. I drink it in the afternoon to help me to relax. 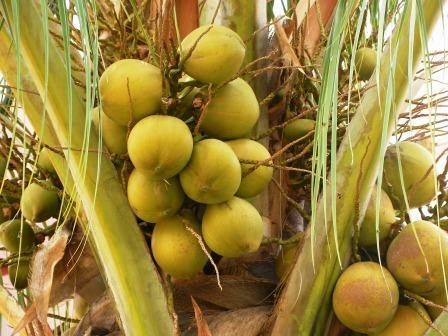 As it is known that coconut water contains kalium which help to relax the muscles, so it is good to drink it when at rest. The next morning I will wake up with fresh body without muscle stiffness. But I dont drink coconut water at night before sleep, to avoid too much going to bathroom for pee, and it will interrupt my sleeping. It is better to drink water of young coconut then the old one, as the old one has more oil. Green coconut water is popular for the prevention of various diseases. Photo below shows green coconut tree, green coconut trees are usually high. Coconut water is consumed as a beverage containing electrolytes sodium, potassium, calcium and magnesium. Coconut water is nutritious and healthy for the body because it is low in fat and calories, thus preventing your body from being overweight. Coconut water can help blood circulation. Coconut water can prevent hair loss due to better blood circulation to the scalp. Coconut water contains lauric acid which helps digestion to prevent inflammation and acidity. Coconut water is not only refreshing, but also gives a cooling effect to your body and the digestive tract and helps control body temperature. Coconut water is also known as isotonic drinks because it hydrates your body. Coconut water is an energy drink with bioactive enzymes that increase metabolism and relieve fatigue. Coconut water can cleanse toxins from the body. Coconut water is low in sugar which makes it a nutritious drink for heart and diabetes patients, as well as help you lose weight. Coconut water is a natural remedy to cure urinary infections, kidney health and prevent kidney stones. Coconut water helps to clear acne skin and smooth the skin. Coconut water can increase good cholesterol (high-density lipoprotein, HDL). 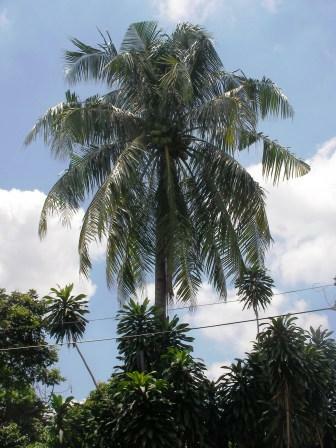 Below is a photo of a yellow coconut fruits on the tree.